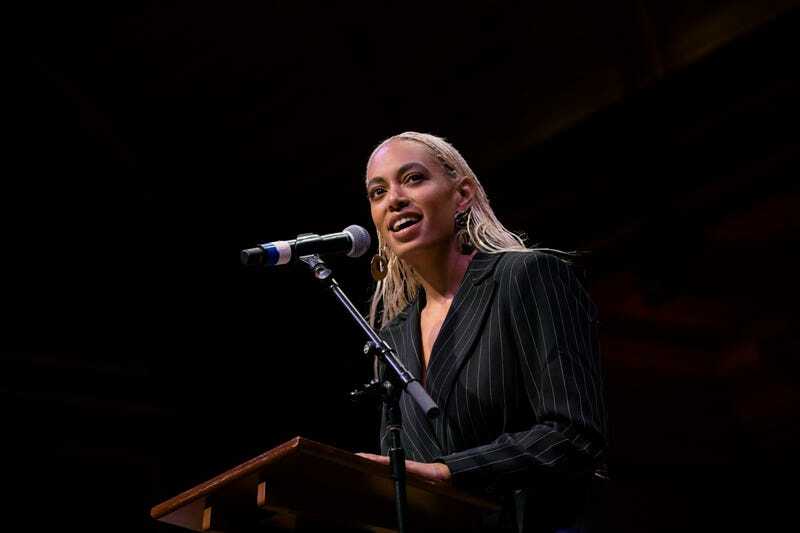 Solange Knowles accepts the Harvard Foundation 2018 Artist of the Year Award at Harvard University’s Sanders Theatre on March 3, 2018, in Cambridge, Mass. It’s a marvel to grow up alongside an artist, and even more wonderful to see the ways in which she or he continues to evolve and shape—and be shaped by—the world in turn. Solange is very much one of those artists for me: a woman whose journey has been far from predictable, whose gifts are a source of continual delight and affirmation. We saw this in her latest album, A Seat at the Table, but we also see it in her growth as a performance artist and the innovative ways that she presents her music live. Now, as Solange is knee-deep in the process of working on new music in Jamaica, the indie R&B singer has written an essay for Dazed that pulls the curtain back on her creative process. The diarylike essay is notable for its intimate, precise details and cyclical structure, starting at Runaway Bay in Jamaica and hitting other ports of creative entry—Kingston, Port Antonio, Grace Jones—before circling back to Runaway Bay. It did. It does. I am hugging this house. Kissing her feet. She is a vessel. To be completely honest, the celebrity-penned essay can be a tired (and, often, ghostwritten) exercise—but neither of those descriptions can be applied to Solange’s writing here. She shares details about recording (and rerecording) an upcoming song, “Where Do We Go From Here,” four times, opening up about her insecurities. Her observations are also quick and exact—she divulges that she has watched “the same Monique interview” all month (“nothing seems more life-affirming at the moment,” she writes). One of the best birthdays I’ve had, was spent on Winnifred Beach, jumping on a trampoline trying to grab hold the horizon and thinking my now husband was going to propose. He did not that day, I really played myself, but he did a couple of weeks later. But it was so close I could feeeeeel it. I feel things really strongly, when I am here. She closes the piece by directly addressing Jamaica, thanking the island for “giving so much, sharing so much, and being a constant place of refuge and retreat when I’ve needed it the most”—a feeling that Solange, as a singer, a performer and a writer, replicates in her own work.